It is with great sadness and a sense of deep loss that the members of Tindal Street Fiction Group pay tribute to one of its members, Joel Lane, who died suddenly on November 25th, 2013. I knew Joel for over twenty years, after he joined the group in the early 90s. But I knew of him before that, saw his name in magazines, we were both in the same issue of ‘Panurge’, his peculiar biting fiction making an impact on me immediately, and I was so happy when he joined the group. He wrote the blurb to my first collection of stories in 1997; I was glad to be his support act at the launch of his chapbook ‘Do Not Pass Go’ (‘Why was it called that?’ I asked. ‘Because I won’t collect £200,’ he said) in 2011. So many memories. One of the best nights of Tindal Street Fiction Group was the night Joel read ‘The Quiet Hours’ to us in Mick Scully’s Chiropractor’s consulting room (the group was temporarily homeless). Such a rich, economic, beautiful story, still my favourite. My surroundings – the black bed that patients lie on, the charts of skeletons and muscles, the desk, disappeared as he quietly read and the story wrapped itself around us all. He explained to me later it was about Charles Beaumont and his extraordinary disease where time speeded up and he aged rapidly. He was always introducing me to new writers, for twenty odd years he was always supportive, he was always there. Now he won’t be, except in spirit. I can’t believe I’ll never see his spidery writing on my manuscripts, the generous and detailed comments, so helpful. I can’t imagine not hearing his gentle voice pointing out what was good in someone’s work, often seeing depths in it that the writer didn’t know existed. Or discussing writers and books or politics down the pub after, getting steadily drunk on white wine. Or that I’ll never see him run for the last bus again after meetings, clutching his bags of books and papers. Or hearing his dreadful puns. Or see him dance to the Clash as he did at my 50th. Seeing him euphoric after a book launch, walking through Birmingham, or when he was down or ill, pushing his hand through his hair, still having time for you. If I go on strike again he won’t be there handing out leaflets, urging compassion and railing against inequality. We have lost, I think, a great man, modest but acutely intelligent, a brilliant writer (he just won the World fantasy Award, the latest in a long line of awards and acclaim). He had fans and friends everywhere around the world. I’m proud to count myself among them. Alan’s tribute sums up much of what was great about Joel. I’ve known him a long time, too. First when he came to Cannon Hill Writers in the mid 80’s, and then when he joined TSFG a little later. In spite of irregular health, he has been one of the most regular attenders, and always supportive to everyone in the group. He was one of the few people who seemed to be able to think in sentences; to have his comments beautifully worked out and articulated – although, as Alan says, he sometimes credited you with ideas you didn’t even know you had, and which were, at times, idiosyncratic in the extreme. But you never discounted anything he said; you knew he had thought about your work and given time to it. His stories were dark and sometimes difficult to read, but always beautifully written; and he was a marvellous poet. 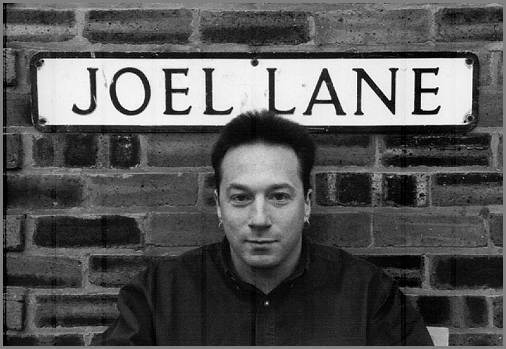 He was given to what he himself referred to as a ‘typical Joel rant’ – always against The System, always for the small people, and yet he was in no way brash or self-seeking – simply very kind, always concerned about other people’s health and well-being, whether it was another member or his mother. He had a wicked sense of humour, too, and it makes me cry to see his face at the top of this page, the slight grin as he poses next to the street sign. He’s irreplaceable. It’s difficult to articulate the sense of shock. And so painful to realise I will never be able to tell him quite how much I appreciated his support, incisiveness and wonderful eccentricity. Joel’s untimely passing should encourage us all to say these things to one another more often. Like every Tindal Street Fiction Group member I will miss him terribly. Joel was such a dedicated writer: he ate and drank writing. He lived for it. He worked hard at it. He generously shared his enthusiasm with so many other writers – for the craft, for the intense passion and pain of the words, and for all the writers he’d read that hardly anyone else had. He was selfless in his support of other writers. And utterly professional. He held down a demanding editorial job and exercised those skills on many forms of creative writing. He experimented and mastered such genres: short fiction, novels (two published by Serpent’s Tail); adult fantasy, horror, noir stories. His poetry was always strong: funny, tough, sensitive, political, tender, alive to the city and the night. He just kept on producing powerful work, never relaxed the flow, and found admiring readers for his darkest explorations. Joel was one of the people who helped bring about the creation of Tindal Street Press and was generous with his advice in its early years. He was a loyal supporter, who came to every single launch in Birmingham. He also masterminded a superb anthology, Birmingham Noir and championed Gul Davis, introduced him to Tindal Street Fiction Group, oversaw Gul’s novella A Long Walk, with the same editorial care and belief in talent as he gave to Steve Bishop and Mick Scully. He was a dedicated member of the fiction group, taking everyone’s work equally seriously, finding subtleties no other reader would. Not an ounce of vanity about his considerable literary track record. When Joel brought forth a considered comment on a workshop story or a question at a book launch you felt you’d been educated. Nothing would stop him reeling off the names of rock and folk musicians and crime writers, politicians, political history – things you needed to know. Nobody knew more about Bruce Springsteen, Richard Thompson, poetry magazines or Cornell Woolrich (and many others) and that enthusiasm rubbed off on us all, of course. In debate– yes, there were disagreements – no matter how staunchly convinced of his position, he remained bright, friendly, driven, serious open-minded – and in his own quiet way funny, dignified. It was always worth the wait, past the hesitation, the eyes looking down, the head being massaged, to hear out what Joel had to say. I think things got harder for him after his father’s untimely death a few years ago, but Joel would make sure he kept an eye on his mum, no matter how busy he was, hard-pressed and frazzled. He would travel across the south side of the city (and for a non-driver that meant night-time bus travel, with a book or two on the go, no doubt, inside the plastic carrier bag that always carried his worldly goods) to help her get by. Indeed, he was a very good man and a very fine writer, and suddenly to be a writer in Birmingham is to feel a huge loss, a huge gap; the city of night will never be the same again. I can’t say I knew Joel well. I’ve been bumping into him now and again for some years. We usually exchanged a few hurried words about literature or politics. I last saw him, by chance, the day before he died. But his death has touched me more than I would ever have anticipated. One of the big reasons (and this is the truth) that I wanted to join TSFG was to have him examine, and possibly praise, something I’d written. He’s still out there, scuttling off to the bus stop clutching his plastic bag of books, grinning at his diabolical puns, puncturing manuscripts with his biro, giving always giving. I can’t say I knew Joel that well, I think we only spoke on a few occasions, the lengthier ones being at political rallies. I think the first time I was aware of his name was when I picked up a copy of the excellent Birmingham Noir, from Tindal Street Press. The first time I saw him read was at Poetry Bites; he came across as shy and read with a nervous energy, but the words that he spoke had such power and confidence that the whole room sat up, caught on every word, every pause. I wish I’d have known him better but more importantly that we’d had him longer, so that we could lose ourselves in more of his stories and enjoy his unselfish support. When I next march through the city I shall look for him, his plastic bag and his copies of Socialist Worker, he won’t be there, and the world is a poorer place for that, but if there is such a thing as a spirit, then Joel’s will be with us. Joel was so supportive when I first joined the Tindal Street group in 2010. My work was apt to get a mauling but he was kind and generous enough to see something in my writing, and to articulate it in a way that I couldn’t. It made me feel better about things, and I’ll miss him. too, an uncommon sensitivity that always came through. I appreciated greatly the advice he gave me about my work and to echo others, my ears always pricked when Joel spoke. I feel very sad at his passing and feel deeply for his mom too, they were such a team. The most wonderful accolade I’ve had as a writer was not when I won my first competition and had my first short story published. It was when Joel, who I always looked up to, and relished reading his work, asked to read my winning story and gave me the most encouraging and heartfelt support with his positive critique of it. I couldn’t ever quite believe that I was in the same group as this most brilliant yet humble writer, let alone that he had set aside time for me. One of my fondest and saddest memories of Joel is being at his book- launch and listening to his moving reading of his beautiful, dark writing, and wondering why the whole world of readers were not there to hear his genius. His writing lives on in all its breathtaking sadness, its frightening truth and its precise and haunting observations of the world we live in. I hope Joel knew how much I admired his work – I was always a little in awe of him, which he never would have understood – but I’m not sure I told him. I wish I had. When TSFG met and Joel was there, everyone knew the session would be of a higher critical and intellectual level, with a mixture of kind critique and earnest encouragement and full of Joel’s wicked sense of humour and mischievous smiles both there and at the pub. I knew Joel was very sad, sometimes. I am sorry I couldn’t help him not to be – I guess we all are. We’re all so shocked and saddened and none of us – those who knew him for a few years and those who knew him for many – though all writers, can quite perfectly express our sorrow at Joel’s passing, in a way that does Joel, our friend and Joel, the writer, our writer, justice. I sincerely hope being a part of TSFG enriched Joel’s life and was a creative and energetic discussion he looked forward to. He certainly enriched our lives and TSFG will not be the same without his most thoughtful air and gentle, kind way. I hope Joel’s found peace, now. Though I don’t believe in much, life owes him that, at least. in this world you created by your will! that are spoken in the world. Let great peace descend on us from the heavens! Let life be renewed for us and for all who Struggle! Make peace for all who Struggle. I didn’t know Joel as well as some here. Whenever I met him I was struck by his charisma. Not in the obvious way, of course. But despite his occasional shyness, he had an extraordinary way of drawing people to him, whether he was reading his work or talking. He leaves a unfillable space. Joel Lane, who was the featured poet in the previous issue of Envoi, died in his sleep at the age of fifty on November 25th 2013. Although he had been in poor health, his premature passing was unexpected and came as a hard blow to his family and many friends. At his packed memorial service, held at the Robin Hood Crematorium in Acocks Green, there was seating for around half of those who had gathered to mourn him. A novelist, short story writer, poet, anthologist, critic and political activist, Joel was greatly admired and loved in his native Birmingham and beyond. Although his metier was primarily as an author of dark fantasy, horror and supernatural crime, his distinctive imagination, powerful sense of place, combined with a poet’s stylistic finesse and passion for language, ensured that his prose work in this field transcended genre. His fame amongst aficionados of fantasy fiction was more than merely local; he had an international following and was widely loved and respected by his fellow writers. He gained a number of awards, the most recent being the World Fantasy Award 2013, which he received a month before his death, for Where Furnaces Burn (PS Publishing), a book of powerful interlinked stories that Joel told me he regarded as his defining achievement. He also published two highly thought of mainstream novels with Serpent’s Tail. and wooded crosses in the mud. hands in the air, signing a chant. incisively and with great generosity of spirit. He was supportive to family members and helpful to his friends and fellow writers. A modest man, Joel shared his writing without dwelling on his achievements; for example, no one in the Tindal Street Fiction Group, of which Joel was a member for many years, was aware until recently that he had graduated from Trinity College, Cambridge with a first in Natural Sciences. He was also known for his predilection for puns, his bulging plastic carrier bags that accompanied him on his journeys across the city and for his affinity with hedgehogs. He lives on in his work and in the memories of those who were fortunate enough to have known him.